Tis the season of giving. The air is crisp, the snow has fallen (sort of) – but in all the joy that encompasses the holiday season, there is always a subtle sense of angst. We can all smell it in the air now, that inevitable jealousy that gathers within us upon realization that Jimmy down the street got that Nerf minigun, whereas you received, yet again, a knit wool sweater with your name on it. Luckily for you, you read Earmilk. Our good friends over at Wantickets have the solution to your annual holiday blues, offering a twelve-day giveaway with prizes guaranteed to blast Jimmy's Nerf gun to pieces. 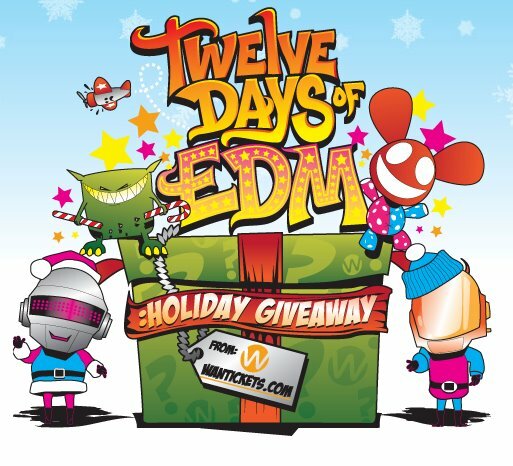 Wantickets has had an incredible year, and in return for their success they want to thank the people who made it all possible – the fans – with the 12 Days of EDM: Holiday Giveaway. The giveaway started on Tuesday, but not to worry – there are still ten days worth of wonderful prizes, and all you need to register for a chance at holiday triumph is "like" their Facebook Page and fill out a short application (participants must be 18 and US citizens). After doing so, you are set to take the neighborhood by storm, rejuvenating the idea amongst peers that you are indeed, the coolest kid on the block, as well as on the internet. Just click the image below to dive into the land of superiority. After registering, be sure to keep up with them on Twitter so you won't miss when they announce that you are now, officially, winning. Enjoy your holidays.